Gathering My Roses: #RealisticResolution with Gorton's and Spark People! Review and Giveaway! #RealisticResolution with Gorton's and Spark People! Review and Giveaway! DISCLOSURE: I received a prize package as compensation for this review. However, ALL opinions expressed herein are my own and based on my own use of and experience with the items. The New Year always brings about a yearning for change and improvement. It's time to make those resolutions: Lost 100 pounds... give up snacks and sodas... stop drinking / smoking / having fun. How long do most resolutions last? Less than 72 hours. Yep... less than three days. Why? Because most of us set ourselves up for failure by setting goals too high to reach. Not this year. 2015 is the THE year for the #RealisticResolution! What are Realistic Resolutions? They are a set of small, attainable goals that can be reached in a timely fashion. 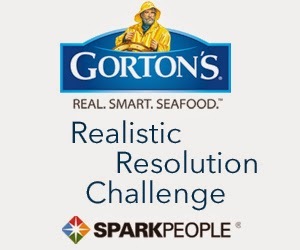 Gorton's Seafood has teamed with Spark People to create a series of tips, suggestions, workouts, and recipes to help you make those resolutions a reality! 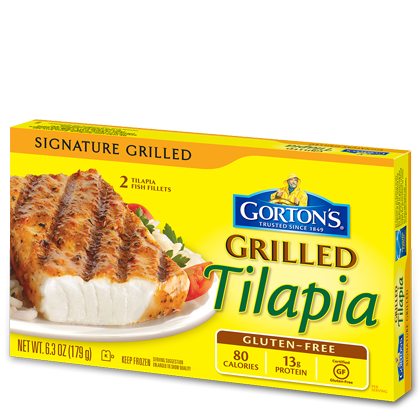 Gorton's Seafood has so many delicious varieties of fish available: Tilapia, Haddock, Alaskan Pollock, Salmon, Flounder, Shrimp, and Clams! And we ALL know that fish is an extremely healthy, diet-friendly, food. Did you know that Gorton's offers eleven (11) gluten-free items? ALL of their grilled products are GF! None of their products contain MSG! Tilapia is my favourite and this is a great recipe! Gorton's has offered my readers a coupon to try one of their amazing fish dishes -- just click here! You may also enter the Gorton’s Eat Smarter Sweepstakes for a chance to win fabulous prizes! Together, we can lose weight and improve our health! I've lost 43 pounds and still going strong! 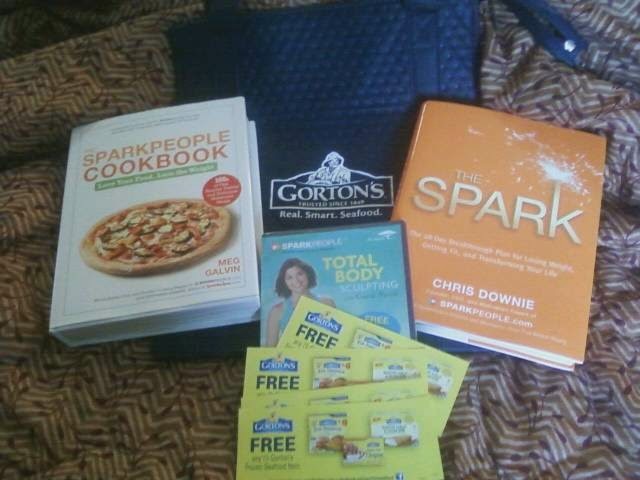 As an incentive, Gorton's and Spark People have offered my readers a chance to win a fabulous prize pack: 2 full-value product coupons, an insulated tote, the SparkPeople Cookbook, the Spark book and the SparkPeople Boot Camp DVD. This is the same package that I received! How cool is that? Gorton's Seafood on Facebook, @gortonsseafood on Twitter, Pinterest, and Instagram. To enter for a chance to win this prize pack, just fill out the entry form below. The more entries you make, the more chances you have! I'm keeping fit, and adding strength training to my routine. I plan to keep increasing my fitness by strength training. My #RealisticResolutions for 2015 is to keep our kitchen table free of clutter. I hope to lose 15 lbs and limit my caffeine intake! My #realisticresolution is to drink more water and move more. My resolution is about ridding my life of clutter and the unnecessary. My #RealisticResolutions for 2015 is to become more fit. My resolution is to quit drinking coffee! My #RealisticResolution is to save more money this year and build my credit. My resolution is just to continue on with my weightloss journey -- I started last year and have had some great success! Thanks for the chance! My New Year's Resolution is to get fit and get back into hiking. I would love to join my friends this summer in a hike up Mt. Washington. I want to be consistent with my daily walking this year. Mine is to be more available and more involved with my family and friends. My #RealisticResolutions for 2015 is to eat healthier and make hatheir foods buy cooking more at home and not eating fast foods or getting processed foods. My #RealisticResolutions for 2015 is to increase the number of days per week I go to the gym. Drink more fruit infused water. My resolution is to add more fruits and vegetables to my diet and a lot less sugar and processed foods. My #RealisticResolutions is to volunteer more of my time at my daughter's school and our church because I want to give something back to my community. I'm cutting sugar and caffeine from my diet. My #RealisticResolutions for 2015 is to lose 25 pounds. My #RealisticResolutions for 2015 is to stop drinking soda and drink water instead. My primary resolution is to no longer eat fast food or any other restaurant food. One of my #RealisticResolutions is to get outside and walk every day. I am just starting a new exercise program. I would like to drink more water. My #RealisticResolution for 2015 is to quit sweating the small stuff. Mine was to enjoy life more. I plan to exercise more, like walking every day. Other than to keep off the 40 pounds I lost since August, I am going to mail a friend or family member an actual card/letter once a month - not counting birthdays! Even before I heard o this giveaway, I decided my family and I needed to start eating fish/seafood. So my #realisticresolution is to eat fish once per week. My #RealisticResolutions is to lose a few pounds. I am trying to lose some weight and save some money. Tell me your #RealisticResolutions for 2015! I plan to drink 64 oz of water per day! To try to start making healthier choices in my everyday life. My resolution is to lose the 10 pounds that I gained by keeping my 2014 resolution to quit smoking. My #RealisticResolution for 2015 is to eat healthier and exercise more, thanks! I am going to make it a point to eat more fish and lean poultry. Also more fruits and vegetables this year. My #RealisticResolutions for 2015 is to sleep better, think more positive and try to have less stress. My resolution is to get fit for my fall wedding. My resolution is to lose 15 pounds. I vow to read my Bible daily. I am resolved to lose weight and improve my fitness and health. My #RealisticResolution is to eat a little better and exercise a little more. My resolution is to quit smoking and lose 10 lbs. this year!! My goal for the year is to just be more productive. My #RealisticResolutions for 2015 is to eat better, ok so far. My resolution is to eat less sugar and sweets. My #RealisticResolution is to eat more vegetables and drink more water daily. I am trying to eat less sugar. My #RealisticResolutions for 2015 is to drink much more water daily and to cut out alot of the beverages I am currently consuming. Mine is to get backpacking ready for my trip starting in June. My #RealisticResolutions is to try and be more frugal this year. My #RealisticResolutions is to consume less sugar! I shall date a rugby player! My resolution is to lose another 25 pounds for a total of 130 pounds! my #RealisticResolutions are to stay organized and in shape for 2015! My realistic resolution is to cut back on the amount of soda I drink. My #RealisticResolution is to swim 3 times a week. My #RealisticResolutions for 2015 is to not procrastinate on everyday tasks. Just do it when I think about it. My resolution is to spend more time with my kids. My main one is to potty train my son. If I manage that, I'll start working on exercising at least 3 times a week for 30 min. My #RealisticResolutions for 2015 is to work harder at becoming debt free. My realistic resolution is to get my chronic pain under better control this year by attending pain management classes and using various other resources to do so. I am trying to eat healthy and loss some belly fat. My relastic resolution is to cut down on the amount of soda I drink. My resolution is to grow more of my own vegetables this year and to eat more healthily! I don't have any #RealisticResolutions for 2015 yet. My realistic resolution is to lose 60 pounds, I did it in 2014 so I know I can in 2015 as well. I lost 48 lbs in 2014 and 10 more to go. My #RealisticResolution for 2015 is to make my goal! The usual lose weight & increase strength but in my case it's imperative due to the arthritis I'm now fighting. My Realistic Resolution is to eat healthier and walk more. My #RealisticResolutions is to enjoy more time outside. #RealisticResolutions I'm going to plan my meals in advance to avoid tempting "bad for you" foods! My #realistic resolution is to get enough sleep every night. My #RealisticResolutions are to move more and eat less.